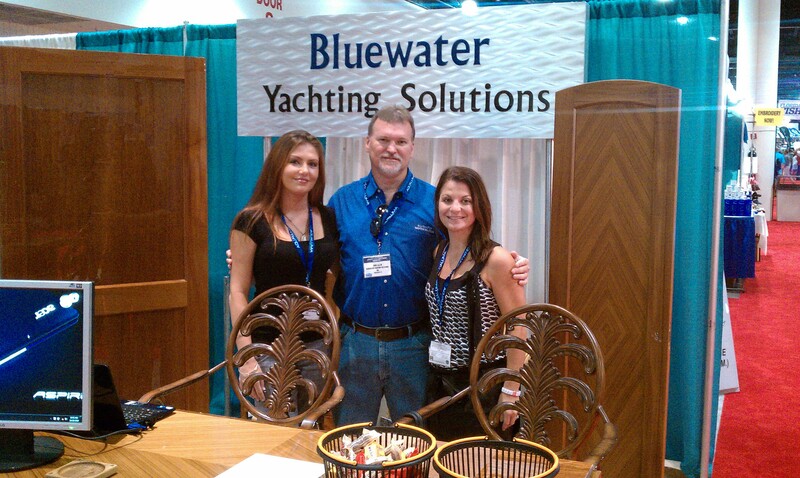 Return­ing to the 2010 Ft. Laud­erdale Boat Show allowed John Allen, CEO of Blue­wa­ter Yacht­ing Solu­tions to recon­nect with old friends from his days as Design & Engi­neer­ing Man­ager of Des­tiny Yachts. A few images from the event are shown below. Enjoy our pho­tos. 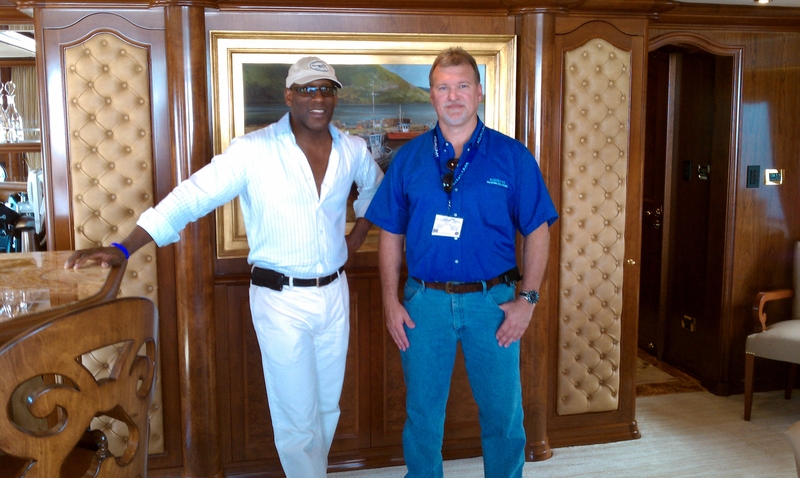 (click to enlarge) In the first you will find John with long­time friend, Evan K. Mar­shall, pre­mier designer of many Des­tiny Yachts, in the sky lounge of one of Evan’s lat­est suc­cesses with Trin­ity Yachts, “Big Zip”. Sec­ondly, see John with old friend Troy Engen, now with Tri­ton Sub­marines, LLC. Next you will see Steve Zuidema, COO, whom also enjoyed catch­ing up with old friends from Des­tiny Yacht days when Steve was the super­vi­sor over the com­pany man­u­fac­tur­ing the inte­ri­ors for Des­tiny. 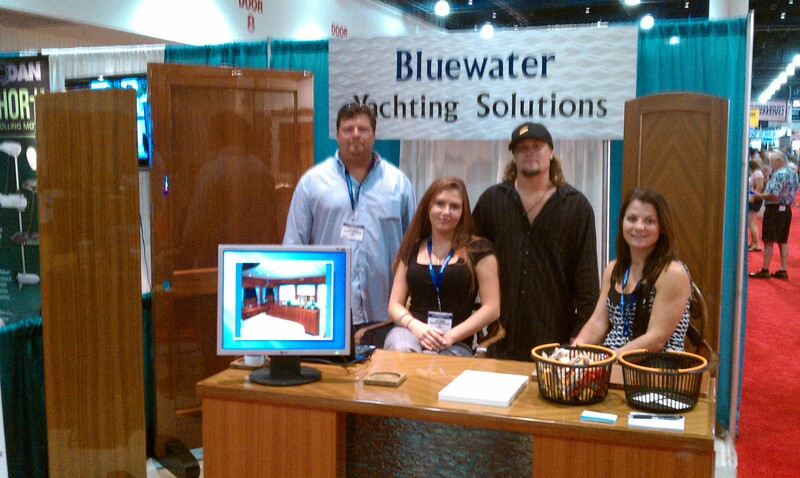 Join­ing Steve in this pic­ture is Blue­wa­ter Yacht­ing Solu­tions lead Fin­isher, Eric Schmidt, Eric’s sig­nif­i­cant other Lau­rie D. and Sunny from Design­works of Florida. Also in atten­dance from Blue­wa­ter Yacht­ing Solu­tions was CFO, David Spiegel, seen man­ning their con­ven­tion cen­ter booth with the ladies. John joined the ladies for a short time as well. While John, Steve and Eric returned to Sara­sota for Friday’s work day, David remained to man the booth and found the expe­ri­ence enlight­en­ing and ben­e­fi­cial. The final image is of Eric & Lau­rie on one of the Viking Yachts that Blue­wa­ter Yacht­ing Solu­tions sup­plied doors for. John with long­time friend, Evan K. Mar­shall, pre­mier designer of many Des­tiny Yachts, in the sky lounge of one of Evan’s lat­est suc­cesses with Trin­ity Yachts, “Big Zip”. 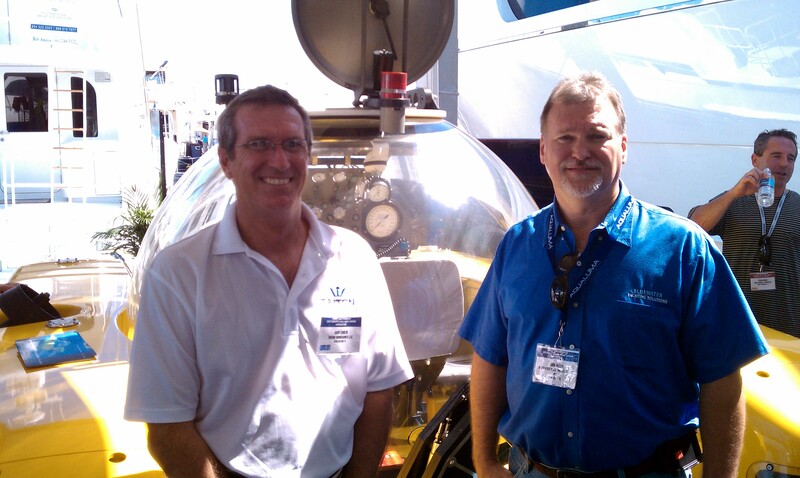 John with old friend Troy Engen, now with Tri­ton Sub­marines, LLC. Steve Zuidema, COO, whom also enjoyed catch­ing up with old friends from Des­tiny Yacht days when Steve was the super­vi­sor over the com­pany man­u­fac­tur­ing the inte­ri­ors for Des­tiny. Join­ing Steve in this pic­ture is Blue­wa­ter Yacht­ing Solu­tions lead Fin­isher, Eric Schmidt, friend Lau­rie D. and Sunny from Design­works of Florida. Also in atten­dance from Blue­wa­ter Yacht­ing Solu­tions was CFO, David Spiegel, seen man­ning their con­ven­tion cen­ter booth with the ladies. John joined the ladies for a short time as well. Eric & Lau­rie on one of the Viking Yachts that Blue­wa­ter Yacht­ing Solu­tions sup­plied doors for.